Sainted Sophronios, Patriarch of Jerusalem, was born in Damascus. From his youthful years he distinguished himself by his piety and his love for the classical sciences. He advanced especially in philosophy, for which they were wont to call him the Wise. But the future hierarch sought out an higher wisdom in the monasteries, and in conversations with the wilderness-dwellers. He arrived in Jerusalem at the monastery of Saint Theodosios, and there he became close with the PriestMonk John Moskhos, becoming his spiritual son and devoting himself to him in obedience. They journeyed together through the monasteries, and they wrote down descriptions of the lives and precepts of the ascetics found there. From these jottings was afterwards compiled their reknown book, the "Leimonarion" or "Spiritual Meadow", which was highly esteemed at the Seventh OEcumenical Council. To save themselves from the devastating incursions of the Persians, Saints John and Sophronios quit Palestine and withdrew to Antioch, and from there they went to Egypt. In Egypt Saint Sophronios became seriously ill. During this time he also decided to become a monk and so he accepted tonsure from the Monk John Moskhos. After the return to health of Saint Sophronios, they both decided to remain in Alexandria. There they were fondly received by the holy Patriarch John the Merciful (Comm. 12 November), to whom they rendered great aid in the struggle against the Monophysite heresy. At Alexandria Saint Sophronios' eyesight was afflicted, and he recoursed with prayer and faith to the holy UnMercenaries Cyrus and John (Comm. 31 January), and he received healing in a church named for them. In gratitude, Saint Sophronios then wrote the Vita of these holy unmercenaries. When the barbarians began to threaten Alexandria, the holy Patriarch John, accompanied by Saints Sophronios and John Moskhos, set out for Constantinople, but along the way he died. Saints John Moskhos and Sophronios with eighteen other monks then set out for Rome. At Rome the Monk John Moskhos also died (+ 622). His body was conveyed by Saint Sophronios to Jerusalem and buried at the monastery of Saint Theodosios. In the year 628 the Jerusalem patriarch Zacharias (609-633) returned from the Persian Captivity. After his death, the patriarchal throne was occupied for a space of two years by Saint Modestos (633-634, Comm. 18 December). After the death of Saint Modestos, Saint Sophronios was chosen patriarch. 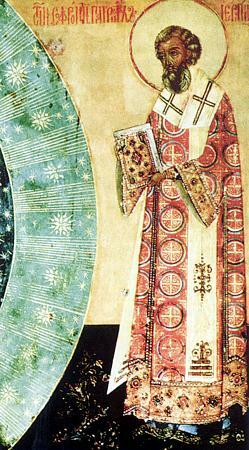 Sainted Sophronios toiled much for the welfare of the Jerusalem Church as its primate (634-644). Towards the end of his life, Saint Sophronios with his flock lived through a two year siege of Jerusalem by the Mahometans. Worn down by hunger, the Christians finally consented to open the city gates, on the condition that the enemy spare the holy places. But this condition was not fulfilled, and holy Patriarch Sophronios died in deep grief over the desecration of the Christian holy places. Written works by Patriarch Sophronios have come down to us in the area of dogmatics, and likewise his "Excursus on the Liturgy", the Vita of the Nun Mary of Egypt (Comm. 1 April), and also about 950 tropars and stikhi-verses from Pascha to the Ascension. While still a priestmonk, Saint Sophronios made review and corrections to the "ustav-rule" of the monastery of the Monk Sava the Sanctified (Comm. 5 December). And the "tri-odic song" of the saint for the Holy Forty Day Great Lent is included in the composition of the contemporary Lenten Triodion.